Restart: The hard man of Singapore's views on ageing. . . . The hard man of Singapore's views on ageing. . . . I received forward e-mail from friend of family, and think this is good! 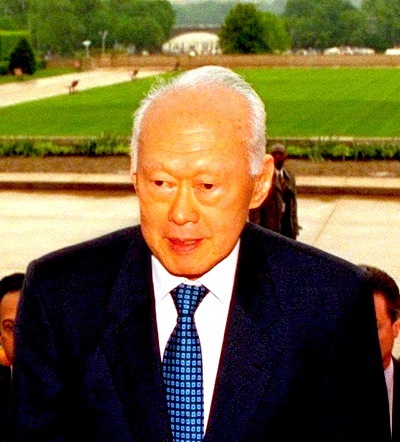 It is about Minister Mentor Lee Kuan Yew's advice on ageing. This is Minister Mentor Lee Kuan Yew's advice on ageing the best way one can. Yesterday, he shared some personal insights into how he himself deals with ageing. Here is the transcript of his remarks. MY CONCERN today is, what is it I can tell you which can add to your knowledge about ageing and what ageing societies can do.You know more about this subject than I do. A lot of it is out in the media, Internet and books. So I thought the best way would be to take a personal standpoint and tell you how I approach this question of ageing. If I cast my mind back, I can see turning points in my physical and mental health. You know, when you're young, I didn't bother, I assumed good health was God-given and would always be there. When I was about - '57 that was - I was about 34, we were competing in elections, and I was really fond of drinking beer and smoking. I remember I had a case in Kuching, Sarawak. So I took the flight and I felt awful. I had to make up my mind whether I was going to be an effective campaigner and a lawyer, in which case I cannot destroy my voice, and I can't go on. So I stopped smoking. It was a tremendous deprivation because I was addicted to it. And I used to wake up dreaming... the nightmare was I resumed smoking. But I made a choice and said, if I continue this, I will not be able to do my job. I didn't know anything about cancer of the throat or oesophagus or the lungs, etc. But it turned out it had many other deleterious effects. Strangely enough after that, I became very allergic, hyper-allergic to smoking, so much so that I would plead with my Cabinet ministers not to smoke in the Cabinet room. You want to smoke, please go out, because I am allergic. Then one day I was at the home of my colleague, Mr Rajaratnam, meeting foreign correspondents including some from the London Times and they took a picture of me and I had a big belly like that (puts his hands in front of his belly), a beer belly. I felt no, no, this will not do. So I started playing more golf, hit hundreds of balls on the practice tee. But this didn't go down. There was only one way it could go down: consume less, burn up more. Another turning point came when -this was 1976, after the general election - I was feeling tired. I was breathing deeply at the Istana, on the lawns. My daughter, who at that time just graduating as a doctor, said: 'What are you trying to do?' I said: 'I feel an effort to breathe in more oxygen.' She said: 'Don't play golf. Run. Aerobics.' So she gave me a book, quite a famous book and, then, very current in America on how you score aerobic points swimming, running, whatever it is, cycling. I looked at it sceptically. I wasn't very keen on running. I was keen on golf. So I said, 'Let's try'. I think the most important thing in ageing is you got to understand yourself. And the knowledge now is all there. When I was growing up, the knowledge wasn't there. I had to get the knowledge from friends, from doctors. But perhaps the most important bit of knowledge that the doctor gave me was one day, when I said: 'Look, I'm feeling slower and sluggish.' So he gave me a medical encyclopaedia and he turned the pages to ageing. I read it up and it was illuminating. A lot of it was difficult jargon but I just skimmed through to get the gist of it. As you grow, you reach 20, 21, 22, 23, 24, 25 and then, thereafter, you are on a gradual slope down physically. Mentally, you carry on and on and on until I don't know what age, but mathematicians will tell you that they know their best output is when they're in their 20s and 30s when your mental energy is powerful and you haven't lost many neurons. That's what they tell me. So, as you acquire more knowledge, you then craft a programme for yourself to maximise what you have. It's just common sense. I never planned to live till 85 or 84. I just didn't think about it. I said: 'Well, my mother died when she was 74, she had a stroke. My father died when he was 94.' But I saw him, and he lived a long life, well, maybe it was his DNA. But more than that, he swam every day and he kept himself busy. He was working for the Shell company. He was in charge, he was a superintendent of an oil depot. When he retired, he started becoming a salesman. So people used to tell me: 'Your father is selling watches at BP de Silva.' My father was then living with me. But it kept him busy. He had that routine: He meets people, he sells watches, he buys and sells all kinds of semi-precious stones, he circulates coins. And he keeps going. But at 87, 88, he fell, going down the steps from his room to the dining room, broke his arm, three months incapacitated. Thereafter, he couldn't go back to swimming. Then he became wheelchair-bound. Then it became a problem because my house was constructed that way. So my brother - who's a doctor and had a flat (one-level) house - took him in. And he lived on till 94. But towards the end, he had gradual loss of mental powers. So my calculations, I'm somewhere between 74 and 94. And I've reached the halfway point now. But have I? I was going to go home. But an MP who was a cardiologist happened to be around, so he came in and said: 'What are you doing here?' I said: 'I've got this.' He said: 'Don't go home. You stay here tonight. I've sent patients home and they never came back. Just stay here. They'll put you on the monitor. They'll watch your heart. And if anything, an emergency arises, they will take you straight to the theatre. You go home. You've got no such monitor. You may never come back.' So I stayed there. Pumped in the dye, yes it was blocked, the left circumflex, not the critical, lead one. So that's lucky for me. Two weeks later, I was walking around,I felt it's coming back. Yes it has come back, it had occluded. So this time they said: 'We'll put in a stent.' I'm one of the first few in Singapore to have the stent, so it was a brand new operation. Fortunately, the man who invented the stent was out here selling his stent. He was from San Jose, La Jolla something or the other. So my doctor got hold of him and he supervised the operation. He said put the stent in. My doctor did the operation, he just watched it all and then that's that. That was before all this problem about lining the stent to make sure that it doesn't occlude and create a disturbance. Had there been no angioplasty, had I not known that something was up and I cycled on, I might have gone at 74 like my mother. So I missed that deadline. So next deadline: my father's fall at 87. I'm very careful now because sometimes when I turn around too fast, I feel as if I'm going to get off balance. So my daughter, a neurologist, she took me to the NNI, there's this nerve conduction test, put electrodes here and there. The transmission of the messages between the feet and the brain has slowed down. So all the exercise, everything, effort put in, I'm fit, I swim, I cycle. But I can't prevent this losing of conductivity of the nerves and this transmission. So just go slow. So when I climb up the steps, I have no problem. When I go down the steps, I need to be sure that I've got something I can hang on to, just in case. So it's a constant process of adjustment. But I think the most important single lesson I learnt in life was that if you isolate yourself, you're done for. The human being is a social animal - he needs stimuli, he needs to meet people, to catch up with the world. I don't much like travel but I travel very frequently despite the jet lag, because I get to meet people of great interest to me, who will help me in my work as chairman of our GIC. So I know, I'm on several boards of banks, international advisory boards of banks, of oil companies and so on. And I meet them and I get to understand what's happening in the world, what has changed since I was here one month ago, one year ago. I go to India, I go to China. And that stimuli brings me to the world of today. I read was very depressing - as you get old, you withdraw from everything and then all you will have is your bedroom and the photographs and the furniture that you know, and that's your world. So if you've got to go to hospital, the doctor advises you to bring some photographs so that you'll know you're not lost in a different world, that this is like your bedroom. I'm determined that I will not, as long as I can, to be reduced, to have my horizons closed on me like that. It is the stimuli, it is the constant interaction with people across the world that keeps me aware and alive to what's going on and what we can do to adjust to this different world. In other words, you must have an interest in life. If you believe that at 55, you're retiring, you're going to read books, play golf and drink wine, then I think you're done for. So statistically they will show you that all the people who retire and lead sedentary lives, the pensioners die off very quickly. So we now have a social problem with medical sciences, new procedures, new drugs, many more people are going to live long lives. If the mindset is that when I reach retirement age 62, I'm old, I can't work anymore, I don't have to work, I just sit back, now is the time I'll enjoy life, I think you're making the biggest mistake of your life. After one month, or after two months, even if you go travelling with nothing to do, with no purpose in life, you will just degrade, you'll go to seed. The human being needs a challenge, and my advice to every person in Singapore and elsewhere: Keep yourself interested, have a challenge. If you're not interested in the world and the world is not interested in you, the biggest punishment a man can receive is total isolation in a dungeon, black and complete withdrawal of all stimuli, that's real torture. This story was first published on Jan 12, 2008.